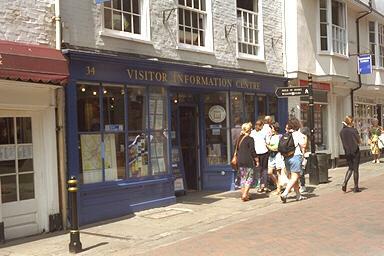 The Visitor Information Centre for Canterbury used to be here, directly opposite this archway. It's now moved into Buttermarket opposite the Cathedral. The shop has had several occupants since, and is now awaiting a new tenant. Turn left to travel out of the city down to the Norman Castle. Turn right to head for the centre of the City and the Cathedral. Behind you is the Marlowe Arcade.